The neighboring country of Singapore has expressed its interest in developing marine tourism in Natuna, Anambas and Lingga, three beautiful yet hidden regencies in Riau Islands province. 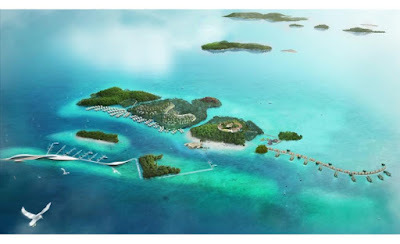 According to Riau Islands Deputy Governor Soeryo Respationo, the three areas have their own beauty but lack of adequate infrastructure to boost tourism. Singapore’s investment in the tourism sector would perfectly match with the islands’ needs, he said Thursday. Soeryo said that Singapore Ambassador Anil Kumar Nayar visited the Riau Islands administration on Tuesday to show the country’s commitment in developing the marine tourism sector. “We had some serious talks on investment in the marine tourism sector,” he said. Soeryo added that further discussions on the potential investment would be conducted at the Singaporean Consulate General in Batam, the capital of the Riau Islands province. Natuna regency is located around 600 kilometers to the northeast of Singapore. It encompasses 272 small islands, 76 of which are occupied. Anambas is located around 325 kilometers to the east of Singapore. Twenty six of its 255 small islands are occupied. Meanwhile, Lingga regency is approximately and has 377 islands. Around 285 of them are occupied.